Stuffed Peppers: It is one the most simple, healthy and delicious weeknight meal that can be made with baked potatoes and tossed salad. In this recipe, I will be making the Stuffed Peppers with ground beef and rice. 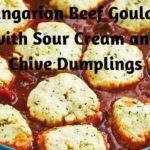 You can also use ground turkey thighs for a lighter option. Bell peppers stuffed with your favorite stuffing and baked until soft and delicious. 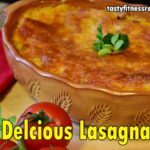 Many people consider this dish a comfort food and I have seen that this recipe is truly my family favorite. This dish will drag your whole family towards the kitchen, craving for some. Beleive me it’s so amazing that the delicious aroma of these Stuffed Pepper will spread throughout your house. In American cuisine, Stuffed peppers is a dish where bell peppers of yellow, green, and red varieties are typically filled with a stuffing such as Turkey thighs, ground beef, mixed with cooked rice or bread crumbs, herbs, eggs, and spices especially parsley and paprika and cheese. Usually, the seeds are removed from the bell peppers, then boil them, stuff them, cover them with cheese, and bake them finally. 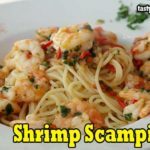 Alternatively, they are also cooked on the stove top at a slow simmer until the peppers are soft in canned tomato sauce. Then usually it is served with sauce. Cut the top and remove the stems and seeds and then chop the top of the bell pepper. In a baking dish place, the peppers, cut-side up. In a large skillet heat 2 tablespoons of the olive oil over medium-high heat. Add the beef, season with pepper and salt and cook for 8 to 10 minutes breaking up the lumps, until the meat just begins to brown and fully cooked through. Add the remaining 2 tablespoons olive oil after wiping the skillet. Add the chopped peppers and onions and cook for 3 to 4 minutes until soften. Add the zucchini and garlic and cook for 1 more minute. Add the tomatoes and season with red pepper flakes and salt. Stir in the rice and beef and add the seasonings and 1 cup of the cheese. Spoon an equal amount of the mixture and top with remaining 1/2 cup cheese. Cover with foil and bake for 30 minutes and until the cheese is melted and peppers are soft cook for another 15 to 20 minutes uncovered. I personally serve it with cooked rice and sauce. Top it with a drizzle of sour cream and sprinkle with fresh cilantro. 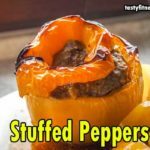 What culture is Stuffed peppers? Pimientos Rellenos or Stuffed peppers are part of traditional Spanish cuisine. The fillings vary from Manchego cheese to cod or chicken in a red sauce; chicken slightly being the most popular. 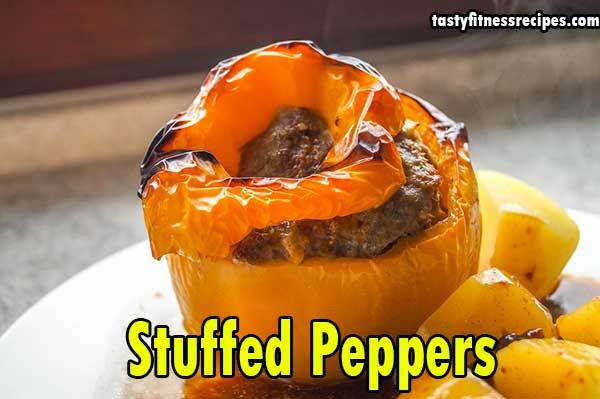 How long do you bake stuffed peppers? Preheat oven to 350 F. Stir cheese into ground beef-rice mixture and fill the peppers. Set peppers upright. Bake in the preheated oven until the peppers are tender and cheese is melted about 30 minutes. Yes, you can but Cool the cooked stuffed peppers before freezing and make sure the meats are completely cooked through or they will require additional cooking once they are thawed. You can freeze each pepper by wrapping them in plastic wrap individually or just Place all of the stuffed peppers into a freezer-safe dish. In a saucepan place the rice and water, and bring to a boil. Cook for 20 minutes covered. In a skillet cook the beef until evenly browned over medium heat. Remove and stems from the tops, and also remove the seeds, and membranes of the bell peppers. In a baking dish arrange peppers with the hollowed sides facing upward. In a bowl, mix the cooked rice, browned beef, 1 can tomato sauce, Worcestershire sauce, onion powder, garlic powder, salt, and pepper. Fill the pepper with rice mixture. Mix the remaining Italian seasoning and tomato sauce in a bowl, and pour over the stuffed peppers. Bake in the preheated oven for 1 hour until the peppers are tender. So, Guys, I hope you enjoy this Easy Stuffed Peppers Recipe which I make on weekly basis. All the food Lovers who are looking for Stuffed Peppers will enjoy this recipe. 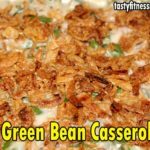 And if you like this recipe then Don’t forget to share it with your friends on Facebook, Pinterest, and other social media platforms. And do follow us on facebook, twitter, Pinterest, Tumblr, and Instagram.